Timeslips Premium or Timeslips Perpetual? Timeslips 2020: Premium or Perpetual? 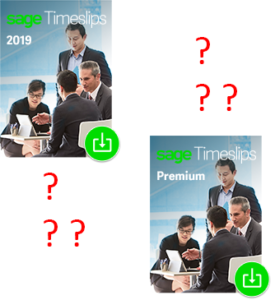 Sage will announce the release of Timeslips 2020 by the end of April. While we do not yet know the ultimate fate of the Timeslips “Perpetual Edition” product, I thought that this is a good time to revisit the differences between Timeslips Premium Edition and Timeslips Perpetual Edition, which I originally wrote about in 2017. So which is the better purchase? Then the Premium subscription product may be the smarter purchase. New features in Timeslips are typically introduced first in the Premium Edition, so Premium users have earlier access to these features. The Premium product is also initially less expensive to purchase (about 75-80% of the Perpetual license cost); of course that initial price difference more than disappears when the annual subscription renewal cost kicks in. I hope this will answer some of the many questions we are asked regarding Timeslips licensing options. You likely have additional questions specific to your needs, your environment, and your future plans for technology usage. We are here for you to help you puzzle through all of those issues. Reach out to us at info@tristardatasystems.com or by phone at 610-941-2116 to learn how we can help. Take a Timeslips test drive with a free 30 day trial download. Click here to download the most recent service releases for all versions of Timeslips currently supported by Sage. Call or email us if you do not see your version listed here and need to apply a service release. © TriStar Data Systems, Inc.